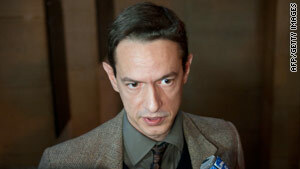 Senior Paris Scientologist Eric Roux speaks to journalists as he arrives at court on Tuesday. Paris, France (CNN) -- A French court's verdict against the Church of Scientology amounts to a "modern Inquisition" and threatens freedom of religion in France, a senior Scientologist said Tuesday. Eric Roux, a spokesman for the group and an official representative of the organization's Celebrity Center, also said the church would appeal Tuesday's verdict. A three-judge panel at the Correctional Court in Paris convicted the church and six of its members of organized fraud, but stopped short of banning the church, as prosecutors had asked. The court also fined the members as much as 400,000 euros ($595,000) each and sentenced them to as much as two years in prison, though the sentences were suspended. Scientology has about 45,000 followers in France, and some of them were in court Tuesday. "We think that this is really a modern Inquisition and that this is really dangerous for the freedom of religion in our country, and for sure we do not agree with that and we will go to appeal," Roux told CNN. One of the judges on the panel said the church may continue its activities in France, but she said those activities must remain "on the correct side of the law." As part of the penalties, the church was ordered to publish the results of the verdict in several national and international magazines to warn people, the judge said, about what Scientology offers and what was discovered at trial. "It's an empty case," Roux said. "It's run like an Inquisition, (as) if some people did not wake up from the Inquisition time." Roux said Scientology is doing well in Europe, and he specifically mentioned Spain, Britain, and Sweden. He said a church opening in Rome, Italy, last weekend attracted 6,000 people. "This is expansion, and people want to support the church," he said, when asked about members being asked to pay money. "We are 12 million in the world, and this 12 million want to support the church, and that's what they do." He said France was a special case within Europe. "You have in France a clique of anti-religious extremists that are making a lot of noise," he said.